Anders Lindegaard shrugged off his disappointment at not starting Burnley’s first game in Europe in 51 years to play a key role in keeping the Clarets very much in the tie. When it emerged that skipper Tom Heaton would not start against Aberdeen at Pitttodrie, due to a niggly calf problem, it was a case of whether Nick Pope - having only returned to training on Tuesday after the World Cup - or Lindegaard would get the nod. Pope got the jersey, but was forced off early on with what looks a serious shoulder injury, and Lindegaard came on for his Burnley debut. His first job was the pick the ball out of the net from Gary Mackay-Stevens’ penalty, but the former Manchester United man made a big save from the same player just after the hour, to keep the score at 1-0. And he said: “I kind of hoped to play the game from the beginning because Nick has just come back from holiday and Tom is injured. "I think I’ve had a pretty strong pre-season. I want to play every game, but I’m a loyal soldier to Burnley and I’m here on their terms." Chances arrive rarely for goalkeepers, through injury, lack of form or suspension, and Lindegaard would prefer not to have seen Pope in such distress: "I’m devastated for him, you could see how focussed he was coming back from the short break he had, he got a lot of energy from being with the national team. I feel very sorry for him." 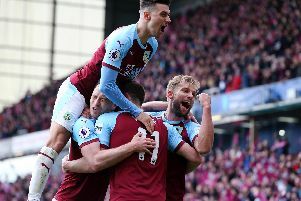 Burnley will start Thursday’s second leg at Turf Moor at slight favourites, due to Sam Vokes’ crucial away goal, but Lindegaard insists there is still much to be done to advance: "It’s not catastrophic, it’s a decent result, it’s always good to get an away goal. "We could have pushed for a second goal but it can be funny with these European matches, it’s different, the referee handles things differently to the Premier League, everyone gets a bit nervy because you want the away goal, there’s a special feel to these European games. "We’re confident, we had a great season (last year), we’ve got a lot of quality in the team but the job is only half done. "It’s still open and anything can happen in these European games, we’ve got to approach the game with a lot of professionalism." Lindegaard is one of the few squad members with European club football experience, and he enjoyed an historic occasion: "You get the feel off it when you’re in the stadium," he added. "You especially get the feel for how big it is for the club when you meet fans and see the fans. It means a lot to the fans and to the club. "We have such a good group that automatically means it means a lot to the players as well. "Not all English teams take it seriously to play in this tournament from this stage but we do, it’s important, our whole approach to it is very serious."